One of my favorite things to do on a sunny summer’s day is to crochet out in the open. And since I don’t have access to a quiet back yard, I decided to go to the park to crochet this hat. I had found a picnic table in one corner all to my lonesome self; and there I crocheted in the good company of my music and wandering thoughts. Before long, her daughter joined us with her kids and they began to speak between each other in their language. Her daughter spoke English, and she passed on her mothers thoughts about the pattern. She said that it would look lovely in bright and many colors. And I totally agree; you could do rainbows, other color patterns, or whatever you like. You could even use up any of your scrap yarns. 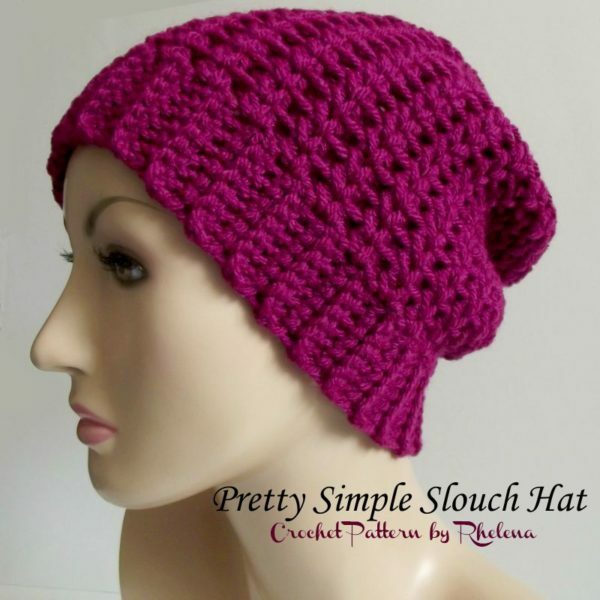 The pattern is so easy to adjust that hook and yarn sizes really don’t matter much for this design as long as you stick with the same yarn throughout. The hat works up quick and easy, and is pretty mindless once you get going on it. And if you like this, you might also enjoy more designs in the ‘pretty simple‘ series. Gauge: 1.5″ over 4 hdc. Finished Size: Lying flat it measures 9.5 across by 9.5 from top to bottom. Fits Teen/Adult Small, but can be increased/decreased to any size. Note: When you work 2 hdc’s into the same stitch or space, think of these as a set. Then when you crochet your next round and the pattern says “2 hdc in sp before next hdc”, work these in between the previous set of hdc’s as pictured. Here is a photo tutorial. Rows 2-54: Ch 1, blsc in each sc across. Turn. (7 sts) Continue with this row until you have reached a desired circumference making sure to end in an even number of rows. Ch 1 and join the ribbing rows by slip stitching the last row to the free lps of starting chs. You might have your own way of doing it, but I like to join the front lps of last row worked to the free lps of starting chs. Rnd 2: Sl st in sp before next hdc, work 2 hdc in same sp, *sk next 2 hdc, 2 hdc in sp before next hdc; rep from * around; join with sl st in first hdc. Rnds 3-21: Rep rnd 2. FO at last rnd leaving a long (8-10″) tail to weave in through last rnd. Pull tight to close and secure. 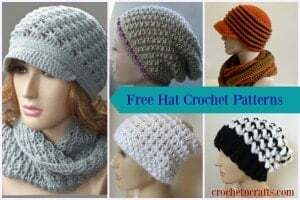 Last but not least, be sure to check out more FREE Hat Crochet Patterns here on CNC, or Visit CPB for over 280 FREE Women’s Hats Crochet Patterns. Thanks and I was even relate!